Apple today increased its trade-in values for select Mac models released in 2009 and later. In partnership with buyback company Phobio, Apple now offers customers up to $2,500, compared to up to $1,500 previously. To determine how much credit you can receive, visit the Phobio website, enter your Mac's serial number, and answer a few questions about its current condition. Phobio will then provide an estimate based on the information provided. 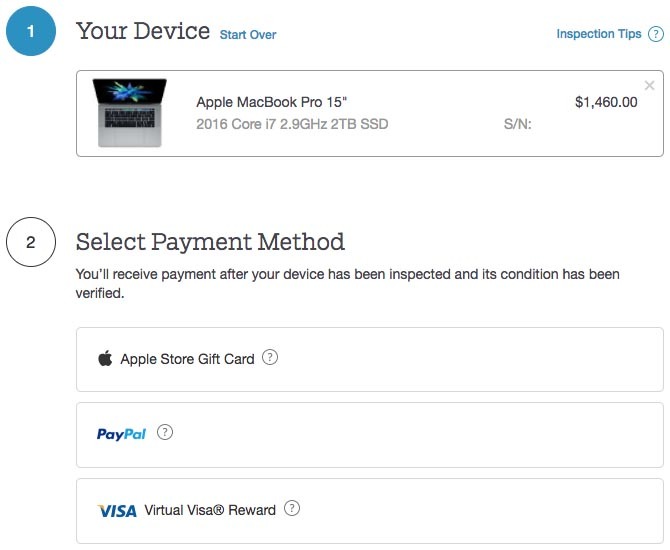 If you accept the quote, you'll receive payment after your Mac has been inspected and its condition has been verified. The payment can be in the form of an emailed Apple Store gift card, PayPal deposit, or a virtual prepaid Visa card. A maxed-out 2017 15-inch MacBook Pro with Touch Bar in good condition, for example, has a trade-in value of $2,510. A maxed-out 2016 15-inch MacBook Pro with Touch Bar in good condition is eligible for $1,460 credit. Apple's trade-up program is convenient, but customers can get better resale value by selling their Mac on eBay or listing it in classifieds such as Craigslist or the MacRumors Marketplace, so long as you adhere to our rules and requirements. Apple also offers up to $500 for select PCs. Meanwhile, Macs released earlier than 2009 are eligible for Apple's free Renew and Recycling program only. Just $835 for my 2 months old new-from-Apple-Store 2015 model 2.8GHz 512GB MBP; excuse me?! Wish they'd change or improve their UK trade-up service (https://appleonlineuk.mpxltd.co.uk). Just put my 2015 13" MBP 2.9GHz i5 into their price evaluation for ***** and giggles. to be fair, is there an asset class that depreciates faster than electronics? Maybe unrefrigerated milk products? I don't expect any resale value and just give mine away to people I know who could use them. I think some people expect Apple to pay more than what they paid for, or at least the same amount, when they first bought their machine based on some of the comments on here lol. I guess some people don't know the meaning of USED. I too can recycle it for free for you! $785 for the 27" iMac listed in my signature? LOL, whatever! I knew they would offer significantly less than what its worth, but I didn't think they would offer an amount that low. We should get one of the privileged reviewers of the new iMac Pro to get a quote. $980 for the Mac Pro listed in my signature? NOT!! !